Nia was watching a cookery programme on the telly a few years ago, with the one and only pensioner baker Mary Berry, who was making these particular cupcakes. She was encouraging children to bake them and so Nia quickly wrote down the recipe on a scrap of paper, which she stuck to the inside cover of her trusted Delia Smith cookbook. 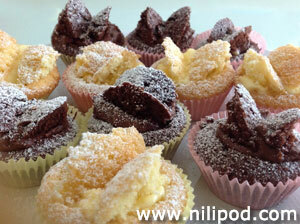 You might also know these as fairy cakes or butterfly cakes, due to the 'wings' stuck into the icing on the top. If you are a chocolate fiend, then add a couple of tablespoons of cocoa powder to the mixture and the butter icing. This recipe really couldn't be simpler and it is hard to get wrong. If you have young children, it is a great way to introduce them to baking, which would be sure to please Mary Berry, so that can only be a good thing. 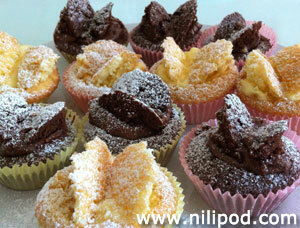 These cup cakes couldn't be simpler to make, because the recipe is an all-in-one method . This means that you just tip everything in together and mix it all up with an electric whisk. Mix together for roughly two minutes, so that you add plenty of air into your batter mixture. Place paper cases into a cake baking tin and fill each of these with a big spoonful of the mixture, making sure that they are all filled up evenly. Bake these in a pre-heated oven set to 180°C, cooking them for around 15 to 20 minutes (carefully check after ten minutes). You will know when they are properly cooked, because they should be golden brown and nicely risen. To make the butter icing, gently beat the margarine and the icing sugar together until you have formed a smooth cream consistency. When your cup cakes have cooled down, cut a circular disc from the tops and slice this in half, to form the butterfly fairy wings. Spoon in the butter cream and position your wings in the centre, as if your cup cake is about to fly into your mouth.